Chief Davis died as the result of an accidental gunshot wound received March 24. As he was checking off-duty, the 50-year-old victim was removing the shotgun from his department vehicle. As he pulled the weapon toward himself muzzle-first, is discharged. Chief Davis was struck in the abdomen. Although surgeons worked around the clock to save his life, Chief Davis died two days later. He was married and the father of two children. 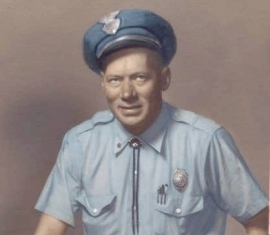 His bronze name plaque is sponsored by the Cedar City Benevolent Order of Police.